Our butterfly release event is just around the corner! Head over to the Donate to Hospice page and select the Butterfly Release Event to order your butterflies. Each butterfly can be acquired with a small, $20 donation! Butterflies will also be available at the door on the day of the event from 10:00 am to 10:45 am. This is an occasion for anyone who has lost a loved one, or to honor a loved one who is living, and to pay tribute to him or her in a very unique way. The butterfly is a recognized symbol of hope, so releasing them together in a loving, supportive environment, is a memorable experience. Hospice Visions, Inc. would like to invite you to honor the life of a loved one by joining us for the 7th Annual Hospice Benefit Butterfly Release set on the Canyon Crest Patio and the walking path on the Snake River canyon rim. Proceeds from this event will help support our “Visions of Home” hospice home. Our Butterfly Release is an uplifting, joyful experience honoring those we love, and remembering those we have lost. 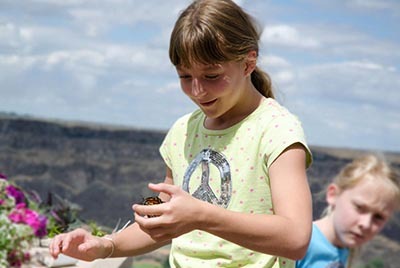 Contact Hospice Visions to reserve your butterflies, visit us at www.hospicevisions.org or call us at 208-735-0121. This year’s celebration will take place at Twin Falls City Park. Registration starts at 8:00 am. 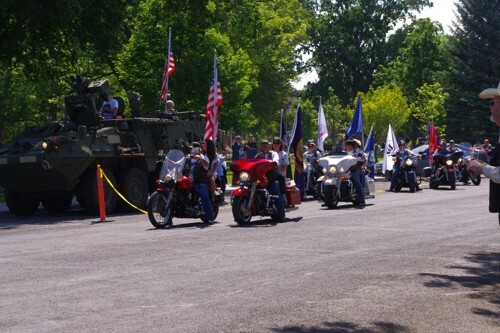 KSU – Kick Stands Up – Ride Begins at 10:00 am. FREE BBQ will start around noon. Please join us in supporting and celebrating our Vietnam Veterans as well as Veterans from all wars and conflicts. There will be live music, and other festivities for all in attendance. For more information please call Angie Quan or Nora Wells at 735-0212. 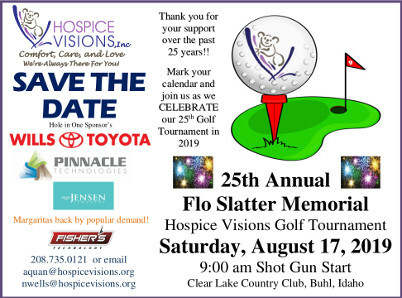 Preparations are under way to ensure the success of the 25th Annual Flo Slatter Memorial Golf Tournament. You or your company can participate at various giving levels. Sponsors receive a wide range of benefits depending on level of contribution, including the opportunity to enjoy the day for a worthy cause with family and friends. All proceeds from the tournament benefit Hospice Vision’s patients. Hospice Visions is the only local, freestanding, nonprofit hospice in the Magic Valley. The funds raised will allow us to continue providing quality, compassionate, and end-of-life care to individuals and their families, who would otherwise experience unneeded burdens at a very difficult time in their lives. It will enable us to assist with medications and treatments for patients who are uninsured or underinsured. Care is provided without regard for ability to pay. No one is turned away. We are here to help those and their families in our community who are faced with a life-limiting illness.